Head out on your own and explore Avon Tyrrell with our Self-guided activity packs. We understand that many of our groups work to a tight budget when making plans for a residential, so we are able to offer a number of self guided activities for you to run yourselves. These sessions are great fun and can often be added on the day, or planned well in advance. Please Note: We do regularly change our routes for activities such as orienteering, so please make sure you get a copy of the latest maps when you arrive. As you explore the grounds around Avon Tyrrell with a map, locate different plates and think about the differences and decide if it has a mammal, bird or insect on it to complete the challenge. The natural environment really is an incredible place. Get hands on and get creative using nature as your inspiration. Learn how to use natural resources that you find outdoors to design something special and unique. An evening campfire is a great way to end a day with your group or family and friends. Gather around the fire and toast marshmallows, tell stories and sing songs as you talk about your days adventures at Avon Tyrrell. Avon Tyrrell has a lot of history and heritage, so here is your chance to explore and find out more about the house, the grounds and the surrounding areas. A great way to explore the centre. After being introduced to some practical map reading skills you will be left to interpret your map as you work together to locate various points within the grounds. Are you ready to solve our riddles? Will you find the hidden treasure? There is only one way to find out, grab a map and get your thinking caps on as you explore the grounds looking for what we've hidden. 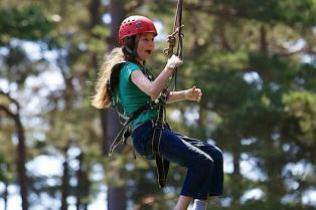 We have an exciting range of outdoor adventure and field studies activities for you to enjoy. With Instructor Led, Self-Guided, Fundays and Drop in Sessions available there will always be something for everyone.